Over the past twenty-five years there have been a number of initiatives worldwide to develop guidelines and standards to enable the safe exploitation of programmable electronic systems used for safety applications. In the context of industrial applications (to distinguish from aerospace and military applications) a major initiative has been focused on IEC 61508, and other standards based on IEC 61508, which have emerged as key international standards. 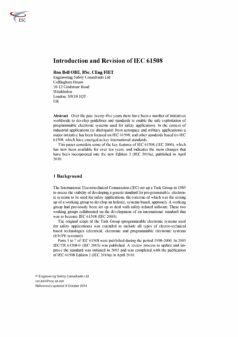 This paper considers some of the key features of IEC 61508 (IEC 2000), which has now been available for over ten years, and indicates the main changes that have been incorporated into the new Edition 2 (IEC 2010a), published in April 2010.